DISCONTINUED. 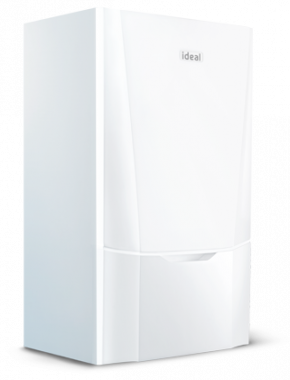 Designed to deliver premium performance the Ideal Vogue 40kW combi boiler is a top of the range boiler from British boiler manufacturer Ideal. It combines modern technology with premium parts and components and is backed by an impressive 7 year warranty. Suited to a large 4-5 bedroom house with 1 bathroom and an ensuite or extra shower room this boiler has a high hot water flow rate for a combi. Smaller properties with lesser heating and hot water needs are also catered for because the boiler is also available in lower outputs of 26kW and 32kW. With a large backlit LCD display and fault history log the boiler will remind you when it is due for a service it's a handy feature of the Ideal Vogue boiler range. It has a stainless steel heat exchanger and integrated frost protection as well as a drop down control panel and room for an optional timer or programmer to be fitted. Accessories include the Ideal electronic 7-day timer Ideal mechanical 24-hour timer and electronic and mechanical programmable rooms stats. The Ideal Vogue 40kW combi boiler has a SEDBUK efficiency rating of 89.10%. Like all Ideal boilers it has been recognized and approved by the Energy Saving Trust for their efficiency.